Three years ago I made the Reversible Strands for Men (and Women, too!) hat for my husband. It’s an amazing pattern by Nancy Smith and worked up in 2 hours. After multiple requests from my son, a few days later I made him one too. They loved wearing their matching hats and looked super cute in them. My son wore this hat EVERY DAY in the winter. Then the inevitable happened. One day he wore it to school and it did not come home. Luckily, it was at the end of winter. Snow made a comeback the day before Thanksgiving and 20 degree weather followed quickly behind so I finally made him a new hat (he’s only been asking for 8 months). But what would he wear around his neck? 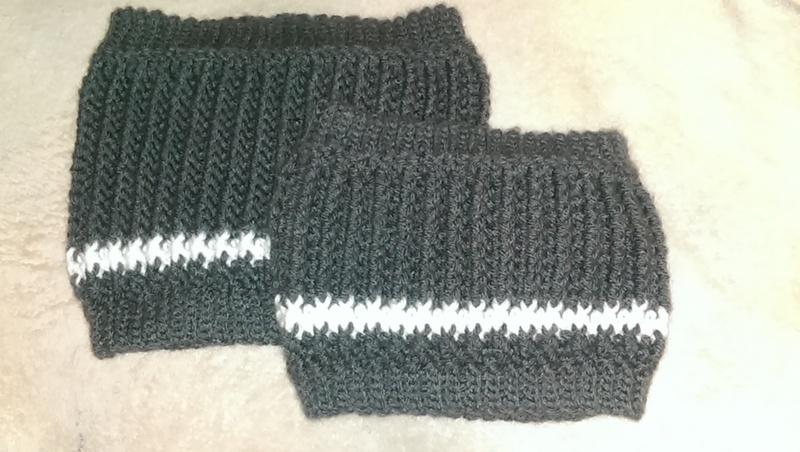 Since I made the hats three years ago I’ve been trying to work up a matching scarf, but nothing ever looked quite right. Post stitches just look so much better in the round than they do worked from both sides. Then it occurred to me. Just work it up as a cowl in the round and add ribbing like Snow No?. Like Snow No? It can be worn with the ribbing pulled up over your nose if it’s really cold or with the ribbing folded in and the cowl pushed under your chin if it’s not. 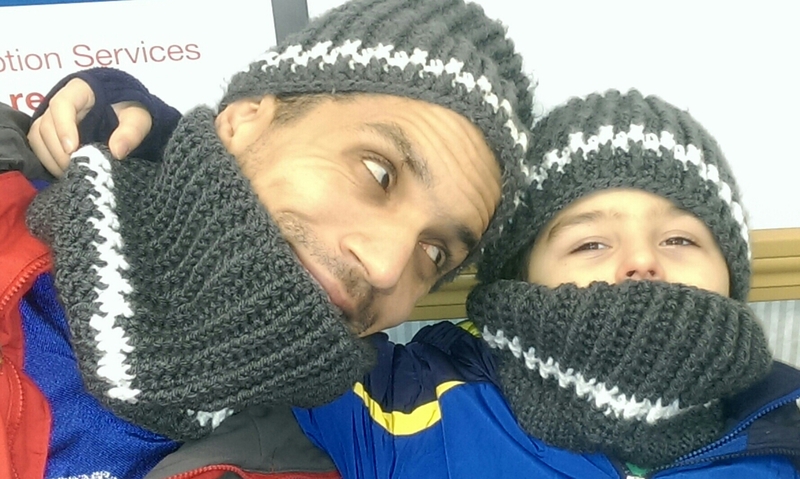 The Striped Cowl came out great and keeps my son toasty. Of course my husband wanted one too so they could match. The body of the cowl is worked in the round and the main stitch pattern used is from Reversible Strands for Men (and Women, too!). You will be joining at the end of each round. Do not turn at the end of the round. First Ch 1 at the beginning of the round does not count as a stitch. Pattern is written in child size with adult size in ( ). You’ll have the same number of stitches for each round of the body of the cowl so to make it longer or smaller, just start with more or less stitches. Make sure it is an even number of stitches. You will be work the edging vertical to the body of the cowl. You will be turning at the end of each row. Be sure to count stitches as you go. It is easy to lose stitches if you don’t. 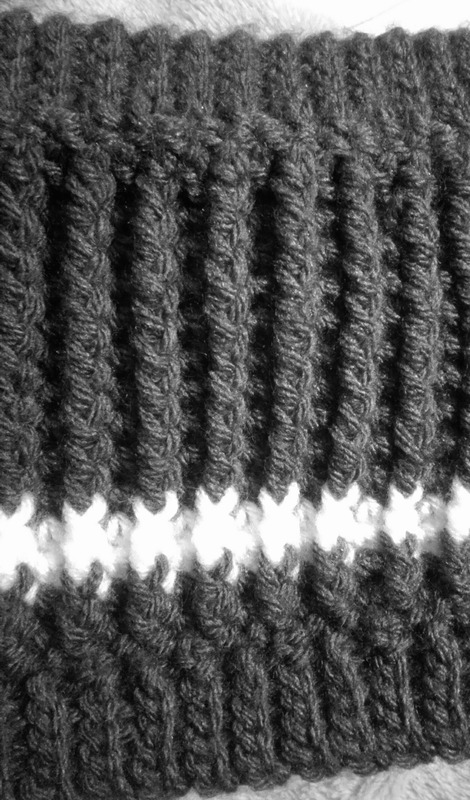 You will always have the same number of stitches in each row. Turning Ch1 and SS that connect to edge of cowl do not count as stitches. Keep your tension VERY loose. You may want to use something to pick up the first and last stitches of each row like the eyehole side of a yarn needle. Repeat Rows 3-6 until you meet up with the beginning, ending with either Row 4 or 6. Now you’ll work the other side of the ribbing. With the wrong side facing you, join yarn in foundation row with a SS, then follow the same directions above for the Edging of Cowl. If you haven’t made one yet, you’ll probably want to make the matching Reversible Strands for Men (and Women, too!) Hat by Nancy Smith which I can’t say enough about.